guaranteed fun for your vacations! 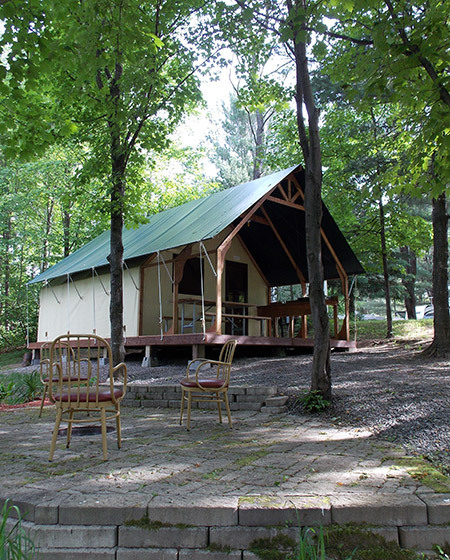 The Saint-André-Avellin campsite knows how to please everyone, whether you are a group of friends or a family planning a vacation, where fun is guaranteed in the Saint-André-Avellin region in the Outaouais region. Here are our rates for the season (May 17th to October 14th , 2019). All prices do not include tax. The rate for one site includes 2 adults and minor children. A 3-day reservation must be made for all civic holidays and a minimum of 2 nights is required for a weekend reservation. Arrival 1:00 pm - Departure 1:00 pm, possibility of a late departure without charge until 5:00 pm., depending of course on the site being available. Please verify with us on the morning of departure. Past 5:00 pm, there will be an additional $3.00 charge per hour for a maximum of 2 hours. May 24-25 / September 6-7 2019 2 nights at $50.00 (plus taxes) Take advantage of this offer! For cancellation made less than 7 days from the arrival date the deposit is non-refundable. For a cancellation made before 7 days, an administration fee of $5.00 will be charge. It’s possible to reserve up to a maximum of 56 nights on the same site. If you wish to add a consecutive stay to your reservation, you must change site. For a reservation from 1 to 6 nights a deposit of 1 night is required for a reservation of 6 nights or more a 25% deposit of the total amount is required. No modifications in either the length or transferring to different dates will be possible.